Coors Brewing Co. | Beer Apprentice - Craft Beer News, Reviews, Interviews and Info. Category Archives: Coors Brewing Co.
Hi guys. Time to mix things up a bit. 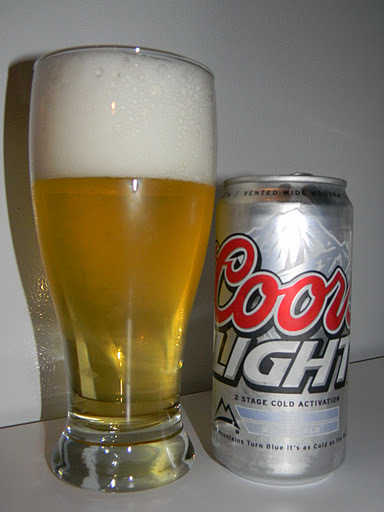 For today’s craft beer review (wink, wink) I’m going to be drinking a Coors Light produced by the Coors Brewing Company located in Golden, Colorado. I was given a 24-pack as a Christmas present from a work associate and I thought it might be kind of fun to try this ever popular “macro” brew. This used to be my go-to beer before I started experimenting with “better beer”. It has been forever since I last had one of these, so I’m really interested to see what I think about it at this stage of my, still relatively young, beer journey. I do promise to be fair and objective about it though. Let’s see if we can find a description from the website, coorslight.com. This beer comes in a 12 oz. can and it has an ABV of 4.2%. The brew poured an incredibly clear, white gold type of color. It literally looked like someone added some yellow food coloring to a glass of water. The crown was huge and bright white from a very aggressive pour. It was very fizzy and soapy. It diminished very quickly and it left zero trace of lace after it subsided. The aroma started with some very pungent grains as well as the stereotypical corn and rice adjuncts. It was very musty too. I thought it might smell clean, but nope…. not a chance. There might be a faint touch of malt in there somewhere, but it was minimal to say the least. It even had that dreaded metallic smell. Oh man, this is not going to be pretty. The taste revealed even more of the grain and the aforementioned corn and rice adjuncts. It did have a very subtle sweetness. Something akin to lemon maybe, however it wasn’t strong enough to overtake the adjunct fillers. Other than that…. not much going on here that I can tell. I feel like I should say more but….. I guess, overall, very light and insignificant. The mouthfeel was thin bodied and extremely watery. Although it was rather crisp, refreshing and thirst quenching. The carbonation wasn’t nearly as bad as I though it might be either. Whatever flavor that was tasted vanished from the palate in a hurry. Well…… this is about what I was expecting. I can’t say that it’s completely undrinkable because I finished it with no problem. I will say however, that if I was stranded in the middle of the Gobi Desert dying of thirst this would be the perfect drink this side of water. Seriously though, I think this brew would be ok during the scorching days of Summer after doing some strenuous yard or farm work, but other than that, I can’t see myself ever craving this beer again. After having it, I’m going to try to not take for granted all of the mediocre craft beers that I can get my hands on. As a matter of fact, from now on, I’m always going to make a point of finding some positive aspects of every craft brew I try. So, with that being said, if you haven’t had a Coors light in a while….. don’t sweat it. You are not missing anything. It hasn’t gotten any better. As always, thanks for reading and commenting guys. It’s much appreciated. Until next time.